The F1 world is wildly cheering peace, love and Concorde Agreements, according to Bernie Ecclestone's latest humorous Christmas card. 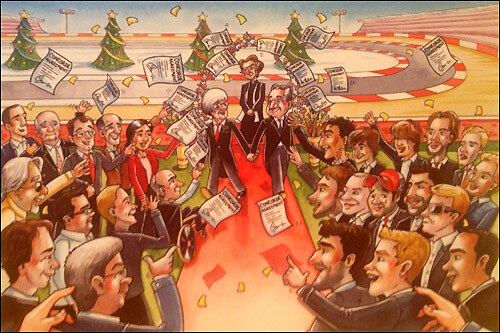 Every year, the F1 chief executive commissions an original cartoon for his annual card to friends and close colleagues, depicting a contemporary F1 issue with a mischievous tilt. For the 2013 holiday season, 83-year-old Ecclestone is depicted as a groom, tying the knot and holding hands with FIA president Jean Todt at a trackside wedding. The priest is Ferrari president Luca di Montezemolo, the bystanders are the familiar faces of team bosses on one side and drivers on the right, and the confetti is pages of the newly-signed Concorde Agreement. Meanwhile, the hands of an unseen and unknown conductor orchestrates the entire scene.